Karen, one of Squawker and Fay’s four eyasses, was named after current EPL director Karen Danczak Lyons. The couple has successfully hatched one female and three male eyasses, who are expected to start flying this month. 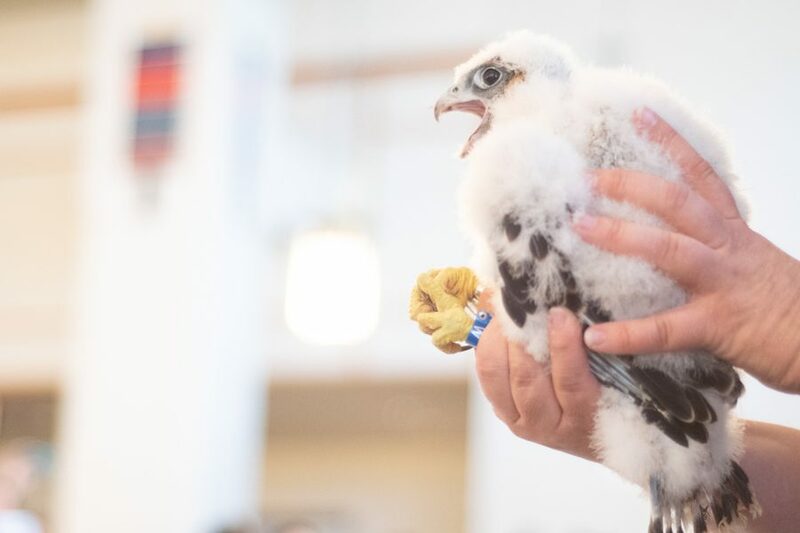 Aviary admirers flocked to the third floor of Evanston Public Library on Tuesday morning to see the naming and banding of the offspring of local peregrine falcons. After an unsuccessful nesting season in 2017, Squawker and Fay returned this season to hatch and raise four eyasses. Josh Engel and Mary Hennen from Chicago’s Field Museum retrieved, identified and banded the four young birds in front of a crowd of all ages. The two also took blood samples for genetic testing while the eyasses squawked and squirmed. The parents anxiously watched from outside the library as their offspring were brought indoors. 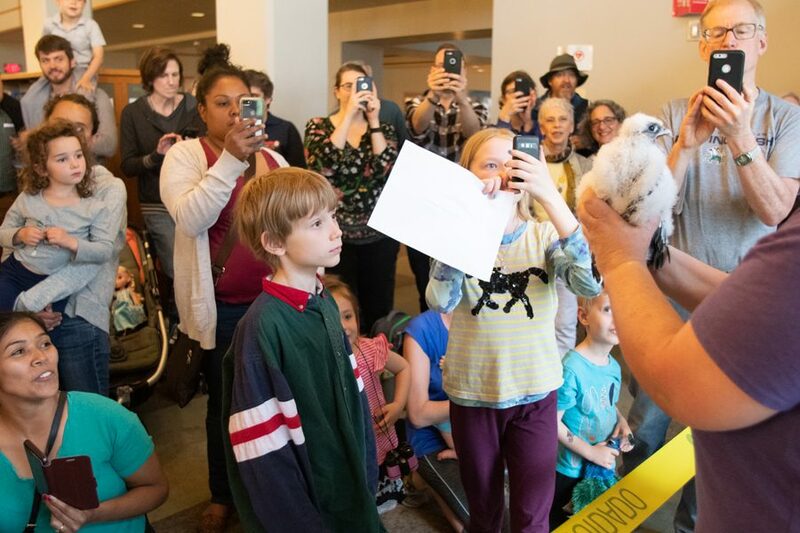 Hennen, director of the Chicago Peregrine Program, said the event was wonderful “as always.” She said she drew particular enjoyment from the engagement of the young audience. “They’re the audience that we want to reach – they’re the future scientists,” Hennen said. Audience members admire and photograph Tango, one of the three male eyasses. All four of Squawker and Fay’s offspring were successfully hatched after a difficult season in 2017. Roughly a third of the crowd were children, watching their youthful counterparts being identified and named. Locals were encouraged earlier this spring to submit potential names for Evanston’s newest falcons to EPL’s communications coordinator Jill Schacter for a chance to have a falcon be named with their submission. Winners of the competition earned a front row seat to the banding ceremony. However, the first falcon that was named at the event did not receive a moniker from a falcon fan – rather, the only female peregrine was named after current EPL director Karen Danczak Lyons. 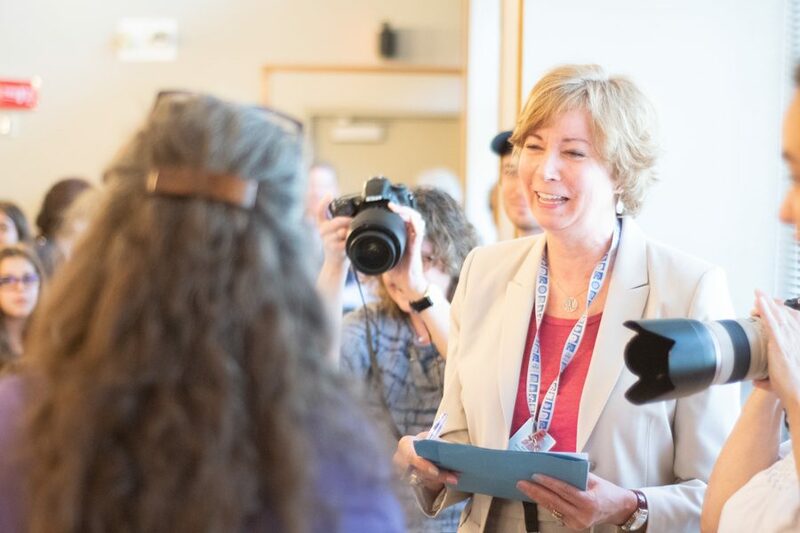 “Karen — meet Karen,” Hennen announced, drawing cheerful applause from the audience and a tearful smile from Danczak Lyons. EPL director Karen Danczak Lyons reacts to Mary Hennen naming a female eyass after her. Danczak Lyons has been director of the library for six years. Danczak Lyons has worked at EPL for six years and said she enjoys the relationship that Evanston has with peregrine falcons. “For us to have a pair of peregrine falcons mature here — a breed that was on the endangered species list for so long — and be embraced … it just shows what a special, loving place Evanston is,” Danczak Lyons said. The remaining three eyasses received names that were submitted by followers of the peregrines, including Claudia Tonella, who has a neighborly relationship with the peregrines. She submitted the name “Tango,” which went to one of the male eyasses. Tonella has lived on the 10th floor of a nearby building for two years and said the peregrines “dance and sing” for her. Tonella said seeing the pair of falcons successfully hatch eyasses after last year’s loss was wonderful and made her day. The eyasses are roughly three weeks old and are expected to begin flying for their first time within the next month.